In Energizing People, Judy Suiter brings you a practical guide to understanding different behavioral styles and enabling you to predict the actions and reactions of others. By unleashing the power of this knowledge, you can expect to improve the relationships in your personal and professional life, leaving you with a feeling of control and optimism. In this book you will learn about each unique behavioral design, how to recognize and communicate among different behavioral styles, how to handle change and energy drains, and learn through easy to understand comparisons how different styles process information and make decisions. The Ripple Effect is a book about leadership, and the difference between just being a manager and a true leader. In this study of how the Global Model of Endorsement Opens Doors to Success, Judy Suiter maps a road to achievement with an explanation and study of how endorsement is gained and lost, given and received, used and neglected. It reveals a practical working model that explains not only how endorsement works, but why it is so critical for progress in both career and relationships. “Our plans miscarry because they have no aim. When a man does not know what harbor he is making for, no wind is the right wind.” So before we set sail on our life’s voyage, it is prudent to take inventory of who we are, what we want, and which talents and shortcomings we possess. Because “we cannot become what we need to be by remaining who we are.” In her book The Journey, Judy Suiter gently helps chart the course through the winds of change. In the essential preparation phase, we will examine our strengths, purposes and shortcomings, leaving behind the baggage that weighs us down. After throwing off the bowline and sailing from the safe harbor, we explore key elements of navigation to keep us on course so that we reach the Port of Call. The employees of an organization are the organizers, the producers, the problem solvers, the interface with customers, and ultimately the final effect on the bottom line. Therefore, when faced with disconnects in the workplace, in the words of Mark Welker, “the problems are always in the numbers; the solutions are always in the people.” Judy Suiter, in her book The Sea of Change, teaches how “financial capital is no longer the sacred resource in business. Human capital is the key to winning.” This practical guidebook addresses challenging situations involving people and their roles within an organization such as unplanned absenteeism, employee retention, generational differences, ethical issues etc. and provides supporting statistics and solutions for today’s workplace. Judy’s two books, Energizing People and Exploring Values, have been translated into Swedish and are available as a combined book entitled Beteenden och drivkrafter. They can be ordered from IPU-Institute for Personlig Utveckling in Stockholm for $90.00 US plus shipping and handling for a set of five. Judy’s three books, Energizing People, Exploring Values and The Ripple Effect, are available in German/English. They can be ordered individually or as a boxed set. The Experiential Trainer’s Toolkit is a one of a kind compilation of training exercises that can be used to produce a variety of results depending upon the focus. This kit includes exercises for use in DISC and Motivators Model training programs. Use the same exercises internationally recognized training consultant, Judy Suiter, has used in her over three decades of team building and training experience to help your company gain and keep the competitive edge you need. Why try to reinvent the wheel when you can have everything you need for successful training experiences all in one customizable kit? Items will arrive conveniently on a CD with all included material, instructions, and answer keys. The exercises can be easily integrated into your existing training programs with your personalized contact information and logo. Please call the office for additional information and to order your Experiential Trainer’s Toolkit today! We are excited to announce this NEW training material for our Clients and Coaches! Which style likes to “sleep on it” before making a decision like Marissa Mayer? A candid risk-taker who is also approachable and family oriented, how would you code Angelina Jolie’s case study? Can you discern Jay Leno’s top motivator after reading the funny story he tells? Polish your own skills and train your clients to see behavioral and motivator clues in everyday interactions through the study of some of the most interesting, well-known people of our time. In the full package, we have included 31 one-page summery profiles on politicians, business leaders, athletes, movie stars, television actors and more. 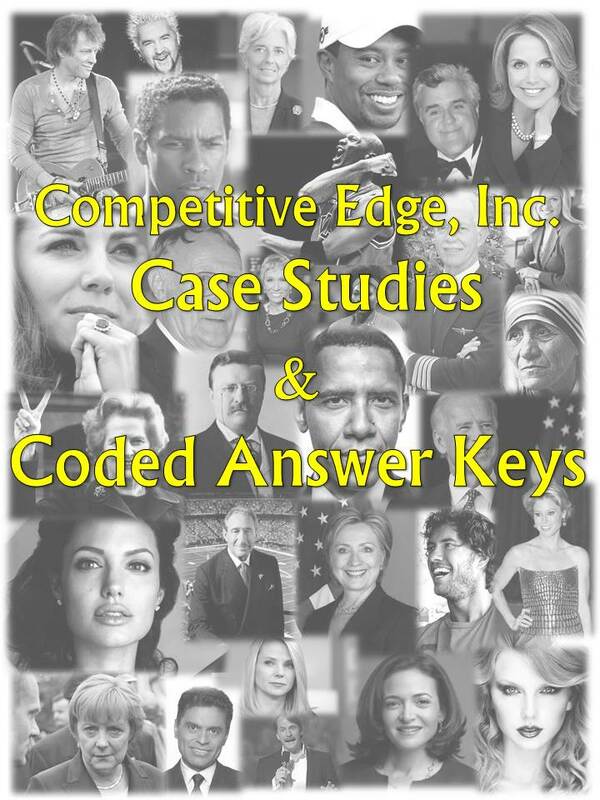 Each profile contains clues about the individual’s behavioral style and/or what their key motivators might be, along with a color coded answer key customizable with your logo and contact information for use in training and coaching. Call (770) 487-6460 for information on a special introductory offer and request a digital copy today! This game is a training tool to assist participants in developing a better understanding of the DISC Behavioral Model. As participants travel from point A to point B, they will begin to recognize the different terrains found in each behavioral style location and begin to understand the various characteristics of the people who live in each of the four regions. Because this game is interactive, it provides the participants in any training session with a learning opportunity as they enjoy their travel. The DISC and DISC/Motivators Quick Reference Cards and training aids are full color front and back and laminated for long-lasting protection. A useful item to keep in your briefcase or desk for learning to understand and deal with the different behavioral styles and motivators of those around you.